Every ThunderStorm subwoofer has detailed controls like switchable satellite filters (full range and 85Hz), phase switch controls (0¡, 180¡). and variable subwoofer filter frequencies (50....150Hz) to let you tailor and adjust your ThunderStorm to your specific room.. 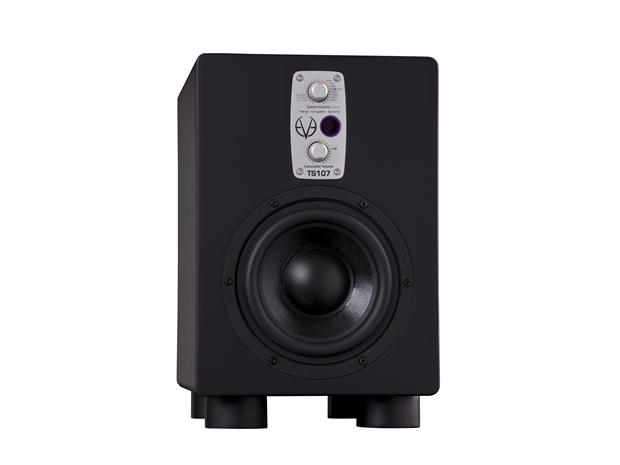 The TS107 is the smallest model in the range of EVE Audio subwoofers and features a very efficient 100W PWM amplifier that drives a proprietary 6.5" woofer. That guarantees a frequency response of 33 Hz (on the lower end), up to 150 Hz, for a maximum output power of 102 dB (SPL @ 1m).. The included remote control will let you adjust not only the subwoofer's volume but also the complete stereo system's volume while sitting comfortably in your sweet spot.. All in all, the ThunderStorm subwoofers will make any system sound better and more complete.. As with every other EVE Audio subwoofer, you get balanced XLR In- and Outputs (Stereo In and Out, LFE In, LFE/Sub Out) for greater convenience.